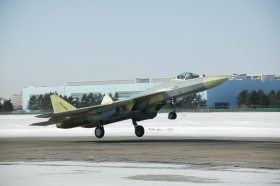 According to ARMS-TASS, Deputy Chief of Rostekhnologii Dmitriy Shugayev told the assembled press corps at the Paris Air Show that Russia’s PAK FA will need about eight years to reach serial production. This sounds like a very different story from what we’ve heard thus far. Most official pronouncements have talked about starting serial production in 2015 or 2016, and pretty much completing the run by 2020. No reason or context was given for what seems a pessimistic appraisal of PAK FA’s timeline. However, it might be connected to the challenge of getting “second phase” engines on the aircraft. This entry was posted in Air Forces, Defense Industry, Force Modernization and tagged Dmitriy Shugayev, PAK FA, Procurement, Rostekhnologii. Bookmark the permalink. I rather doubt it is actually the engines that are the problem. I think the technical challenge of putting together a stealth aircraft in such a way that it is relatively grunt proof is a steep hill to climb. The number of separate panels in the outer surface will need to be minimalised once they have decided which panels need to be access panels for avionics and other equipment and which panels can be fixed in place permanantly. On top of that a whole new generation of AAM needs to be developed because conventional IR guided missiles like the R-73 are simply no use in a 5th gen fighter. Very simply the R-73 needs to lock on to its target before it is launched from the aircraft… which would be tricky to do while the missile is sitting in an internal weapons bay. I suspect the next gen Russian AAM will likely have a QWIP seeker and a datalink to enable it to be launched and then directed by the launch aircraft to intercept the intended target. The QWIP technology will also be very useful in various optical sensors on the PAK FA too. On top of all that the helmet mounted display and the millions of lines of computer code for the sensor fusion design will take time to test and debug. I also suspect they will want a high Russian content in this aircraft so a delay is only good in that respect. Also any development work with India on their FGGA will further benefit the PAK FA design… in the same way that the Su-30MKI work probably helped Sukhoi with the Su-35 and Su-34 programs.